What Is DA Form 759-3? DA Form 759-3, Individual Flight Records and Flight Certificate-Army (Flight Pay Work Sheet) is a form generated by the Centralized Aviation Flight Records System (CAFRS) and used for keeping record of hours spent performing flights in order to calculate flight pay. The form is used as a temporary or consolidation worksheet for flights performed by a RCM/NRCM and conditional ACIP recipients and is not required for UAS operators. The newest edition of the certificate - sometimes incorrectly referred to as the DD Form 759-3 - was released by the Department of the Army (DA) in July 2018. The latest DA Form 759-3 fillable version is available for digital filing and download below or can be found through the Army Publishing Directorate website. A DA Form 759-3 can be used as a daily or monthly record - a new form is not required for each month. See Department of Defense Financial Management Regulation (DoD FMR) Vol. 7000.14, AR 37-104-4 for requirement to manage monthly flight hours. How To Fill Out Da Form 759-3? For use of this form, see TC 3-04.11; the proponent agency is TRADOC. Box 1 should be left blank. Box 2 requires the full name. Block 3 is for entering either the military rank, "DAC" (Department of the Army civilian), "CIV" (civilian employees of government agencies) or "CTR" (government contractor). If not applicable, the block should be left empty. Box 4 is for specifying the period covered. Box 5 requires the type of flying status (non-rated crewmember - NRCM - or non-crewmember - NCM). Box 6 is for the effective date from the flight orders. The next block of the form is a blank chart for recording information about completed flights. Column A is for the dates of flights. The month and day should be entered on two seperate lines, with the day entered under the month with a blank line left underneath. The comment "No Time Flown" must be entered across Columns B through D for months with no recorded flight hours. The information in Columns B, C, D and E is taken from the DA Form 2408-12 and includes the aircraft mission, design, type and series, flying duty symbol, flight condition symbol and mission symbol. Column F is for the hours flown (recorded in hours and tenths of hours). Columns G through K should be left blank and completed at the end of the month on the consolidation worksheet. Boxes 7 through 15 should be left blank. DA Form 759, Individual Flight Record and Flight Crew Certificate - Army (Flight Hours) is a document used to close out flight records. DA Form 759-1, Individual Flight Record and Flight Certificate - Army (Aircraft Closeout) is a form used to record the individuals flight time during the closeout period for each aircraft or flight simulator used. 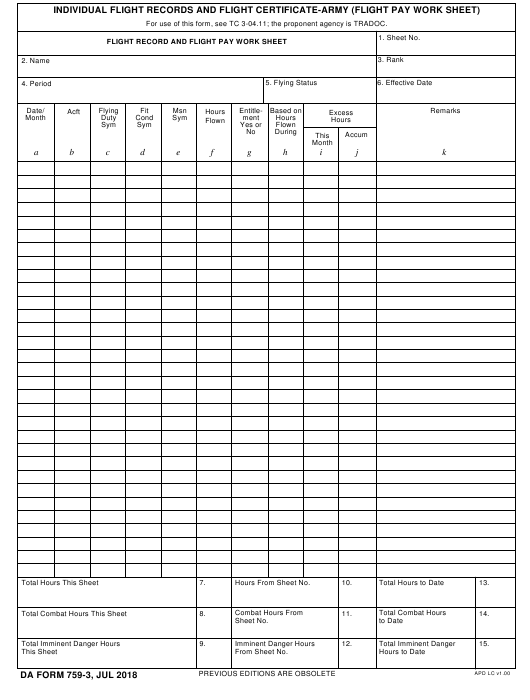 DA Form 759-2, Individual Flight Records and Flight Certificate - Army (Flying Hours Work Sheet) is a temporary or consolidation worksheet used as a record of an aviator's flight hours. DA Form 2408-12, Army Aviators Flight Records is a form located in an each aircraft logbook and completed after every performed flight. At closeout, flight record forms are arranged in the DA Form 3513, Individual Flight Records Folder, United States Army.